Energy saving – Cost saving – Carbon Saving. Let's keep Africa Green. You are currently browsing articles tagged led lighting. By 2020, 8 out of 10 lights you see will be LED lights. The lighting revolution is no different to the communication and information technology revolutions that have driven our development. So what are the 10 great reasons to make the change? Do you really switch on your lights to heat up the room? No! But 85% of the electricity going into your incandescent lightbulb is emitted as… heat! 60 Watts of energy ends up heating up your room… not great! Yes, UV radiation is emitted by our current lighting. You are not about to get a beach tan from your lighting, but UV light is an issue, and it will impact fabrics and paintings. LED lights have no UV emissions. Fluorescent lights contain mercury! LED lights contain none. Your choice! LED lights are made of plastic and aluminum…no glass. So there is no safety issue and no glass that can shatter and cut. How “real” are the colors under different light sources? Is pink really pink? Under fluorescent light, you may see about 65% of the “real” color. Incandescent lights are better at around 90%, but LEDs come in across the board at around 80-90%. So similar for LED replacements of incandescent lights but if you replace fluorescent lights, you’ll have a great reason to change your lights. We’ve talked about lumen efficiency per watt of electricity. But what about power efficiency. LED lights use from 2-10 times less power for the same light output. Incandescents put out less than 15 lumens per watt (consider lumens as a measure of light output). Enter the LED light – 7 Watts at 100 lumens per watt. 7 Watts of electricity will cost you a lot less than 60 Watts! That’s a great reason to replace your lights with LED lights! LED lights emit light where you point them…not behind them like an incandescent light. Direct the light where you need it…who needs the ceiling lit when you are more interested in the light on your dining table? You can literally make your LED lights in any color – some even change color with a remote control. So mood lighting is possible and not only can you dim them, but change color as you need to. LED lights run on 12 to 24 volts. So a broken bulb will not kill you! A pretty good reason to change your lights to LED lights! So there are 10 reasons… why not contact LED Lighting Solutions to advise on your LED light replacements. It has only been 20 years since Africa was introduced to the cellphone. In that time, millions of people have gained access to a communication tool that has changed lives and kept friends and families in touch in places that would never have been reached by land lines. A similar kind of revolution is taking place in Africa – lighting. Light is key to the social fabric of most societies – allowing people to meet, socialise and work after dark. In so many villages across the continent, light is either provided by fires, paraffin lamps or candles. Electricity is a luxury for many – either not available or too expensive to connect and use. If you’ve ever tried to read a book by candlelight or the flicker of a paraffin lamp, you’ll know that after a while, the low light level and the flicker will tire out your eyes. Yet millions of students study by candle light or paraffin lamps every day. Until now there just hasn’t been an alternative. Enter a low energy consumption light source (LED lights), a mechanism to create power (solar cells) and a cheap way to store energy (rechargeable batteries). While solar and battery technology has been around for some time, led lighting has only recently become viable with higher lumen outputs that make their performance acceptable. But that is not the only reason that change is about to accelerate. What will drive the change is the cost reductions in all three technologies. In fact, with ever increasing oil prices trading off against technological breakthroughs and scale advantages of these new technologies, pricing is coming within range of “affordable”. A 2 watt solar cell with a battery and a series of small LED lights can light up a small house and now with improvements in quality and longevity, the upfront cost of purchase can be recovered very quickly. Thereafter, the lighting is effectively free and plentiful. All this thanks to the amazing low power consumption of led lights. With over 100 lumens per watt now becoming the standard, just 3 watts can light up a desk or a kitchen area with enough light to see and work by. Besides the cost recovery angle, the quality of the led lights is far superior to the alternatives anyway, and so students can study with cool white light that does not stress the eyes. 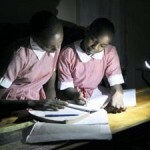 As we move through 2012, and the cost of led lighting declines, and new technologies impact the solar cell and battery components, expect to see led lighting move through Africa at a rapid pace. Perhaps not as fast as the cellphone, but like the cellphone, it will bring welcome changes to the social and educational environment in Africa. How to save $137.25 by doing nothing! Saving money by doing nothing? What kinda scam is this! No scam actually. It’s easy and you can read about it here in this published article. Buying LED lights – don’t be fooled!